There are several calorie counters available for BlackBerry, some are expensive, some are cheap or even free. Loading a diet app on your BlackBerry is the easiest part of losing weight. Establishing a new healthy lifestyle and achieving permanent weight loss is more difficult. You need to find a proven, solid program that works well. Something that is easy, takes the minimum of your time, something that you can use every day and will not give up. Healthy weight loss does take time. Older BlackBerry apps available on the App World have tiny 5,000-8,000 foods database, are quite cumbersome to use, and don't work with a web site. There are several newer apps that integrate with web sites, but their food databases are entered by users and have too much wrong or out-of-date nutritional information, and the apps themselves are very limited in functionality. MyNetDiary is the only full-featured, serious, uncompromising diet app for BlackBerry. And we made every effort to make MyNetDiary a pleasure to use every day. Let us show you why MyNetDiary is the best. MyNetDiary is the only app that instantly and intelligently searches while you type. With MyNetDiary, you can enter foods 2-3 times faster than with any other app. And MyNetDiary remembers your food choices, so the next time you need to type only first few letters to find it. With 979,000 foods and growing weekly, you rarely need to enter food labels. Equally important, MyNetDiary database is accurate and up-to-date, without duplicates. We have a great team working on food research every day - if some foods are not yet in our database, let us know and if this information is available from the vendor, we will enter food labels for you. We call it Continuous Food Research process. 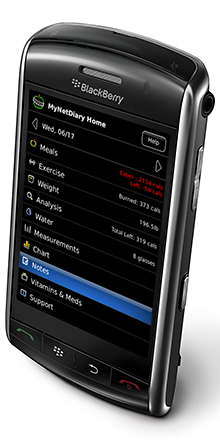 MyNetDiary is much more than a calorie counter. Our service opened to the public in summer 2007, and we provided the very first iPhone-optimized food diary in January 2008. We relentlessly refined and improved the service since then, adding features requested by our members. And now, as many of our members use BlackBerry smartphones, we created a free BlackBerry app to help you keep your diary on the go. It is as advanced in every aspect as our leading, state-of-the-art iPhone app. We have everything - measurements, recipes, charts, reports, export to Excel, and much more. Our support team responds quickly to your questions and inquiries. We all love our smartphones and rely on them every day. But healthy weight loss takes time, and similarly to e-mail, you may want to use the comfort of your computer, with its large screen and keyboard - when you are home or at the office. With MyNetDiary you have the flexibility of keeping your diary on a state-of-the-art web site, or your BlackBerry. The web site and your BlackBerry are always in perfect sync. The science of losing weight with food diaries is sound and proven, millions of our members lose weight every day. But sometimes we need just a bit more motivation, a bit of a help to fight a weight loss plateau, or some friendly support so that we don't feel alone in our journey to better health. MyNetDiary Community is a friendly place where you can team up with other people to get the needed support, keep your motivation high and build long-term dieting accountability. Our community forums are supported by a Registered Dietitian. We offer Maximum efficiency membership starting from $5 per month, which is less than the typical online weight loss program fee. We also provide much better service and iPhone and BlackBerry apps for on-the-go access. We do not show any ads and never share or sell e-mails. Paid service enables us to provide you with the best service possible. We keep our 716,000 food database up-to-date and we quickly respond to your questions and support requests. There are no "completely free" apps or web sites, you always pay - if not with money, then with your time, convenience, and the risk of giving up your diet overwhelmed by an awkward "free" diary. Most importantly, our members lose weight with MyNetDiary and they love MyNetDiary. Almost every day, we receive e-mails and praise from our members, describing how MyNetDiary helped them to achieve their weight goals. Have a BlackBerry? Get our free Calorie Counter for BlackBerry from the BlackBerry App World. Test drive the app and see it in action, no e-mail or registration needed. BlackBerry Bold, Tour, and Curve 8900: http://s3.amazonaws.com/files.mynetdiary.com/MyNetDiary46.jad. 82xx, 83xx, 88xx, 87xx (running OS 4.5 and later): http://s3.amazonaws.com/files.mynetdiary.com/MyNetDiary45.jad. Please, notice that using MyNetDiary app for BlackBerry requires Maximum membership.